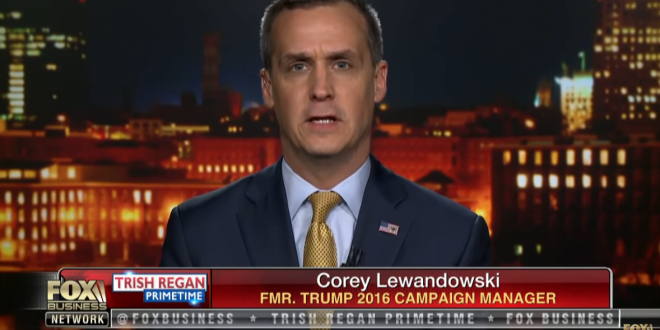 Corey Lewandowski: Democrats Must "Dial Back" Their Anti-MAGA Hate Speech After Terror Attacks Happen - Joe.My.God. “Many on the left, in the minutes following the tragic shootings in New Zealand, raced to blame President Donald J. Trump as motivating the killer. It is truly a despicable act to use a tragedy for political gain, yet this is an all-too-common tactic for many on the political left. The Democratic Party and voices on the left need to dial back their hate speech. “Their actions have led to people wearing ‘Make America Great Again’ caps being kicked out of bars and restaurants for showing support for the president of the United States. We hear much talk about tolerance and civility from the left — yet, they only want to practice those ideas on people with whom they agree. “The only person to blame for the mass shooting in New Zealand is the deranged person who committed the act. Democrats should not be allowed by the media to use that or any other tragedy for political advantage.” – Former Trump campaign manager Corey Lewandowski. In the above-linked piece, Lewandowski laughably claims that conservatives did not blame Democrats after the shooting of Rep. Steve Scalise. He also fails to mention the 2012 shooting at Family Research Council headquarters, which right wingers continue to relentlessly blame on liberals and the SPLC. RELATED: Lewandowski is also the same Trump cultist who mocked a Down Syndrome child with “womp womp” after hearing of her abuse by ICE agents.